Well, Sony appears to have been paying attention to what Warner and Universal started doing three years ago -- they're bringing out attractive multi-disc sets like this Cary Grant grouping. The packaging follows Universal's example except that each film is on its own individual disc and the price is a bit high. And then there's that old marketing 'gotcha!' that will irk loyal customers, the ones who bought the four titles that have already been offered individually: At least for now, the much-desired Holiday is available only as part of this new set! Collecting DVDs is getting to be like collecting baseball cards --- one quickly amasses a tall stack of duplicates. Fortunately, these five titles are all A+ pictures representing great work by George Cukor, George Stevens, Gregory LaCava and Howard ("Let's have a singalong!") Hawks. Cary Grant made some of his best movies with Harry Cohn at Columbia and they're all right here. And ... don't faint ... Sony/Columbia have added some new featurettes! Two of these shows have already been reviewed at DVD Savant and can be accessed by these links: The Awful Truth and The Talk of the Town. The first is one of the best Screwball comedies ever, and the second is a "serious comedy" by George Stevens that tries too hard to be a civics lesson. The picture quality of The Awful Truth is an improvement on the old Columbia-TriStar disc -- a lot of dirt has been rendered invisible. The picture is brighter overall, with some scenes looking sharper. But scenes that looked soft or slightly dupey on the old transfer haven't changed. The old disc had no extras, but this edition has been given a pleasing featurette on Cary Grant's life with an enviable lineup of critics: Marc Eliot, David Thomson, Andrew Sarris and Molly Haskell. The Talk of the Town is also cleaner and brighter than the earlier disc, but the same element appears to have been used in the transfer (or the same transfer was given a digital scrubbing). We can tell this because of scratches that appear in the same places, including one fine line running through most of the final courthouse scene. The first disc had no extras, just promo trailers for other movies. A new featurette gives us George Stevens, Jr. to talk about his father's film. If you'll look at DVD presentations of George Stevens films you'll quickly see that his son dominates most of them. This does the memory of the great director no good, as it is becoming harder to hear his strengths and weaknesses debated by other voices. Holiday is the only new title in the batch, and the one everyone wants to see. Written by the same playwright who tailored The Philadelphia Story for Katharine Hepburn, this is yet another frolic with the ultra-rich in their Park Avenue digs, an elitist social satire. A daughter of the snooty rich finds love by catching her sister's beau on the rebound. He's an up-by-his-bootstraps man of the people who expresses his joy for life by performing impromptu cartwheels and handstands. Debutante and rebel exit the soft life to find adventure and truth while they're still young. Did I mention this is a fantasy? Julia Seton (Doris Nolan) brings home her fiancée Johnny Case (Grant) for her father's approval, but Johnny's wild ideas are met with horror: He plans to make a business killing and then take an indefinite life "holiday" before going back to work. Julia does her best to change her sweetheart's mind, but Johnny is supported by his friends Nick and Susan Potter (Edward Everett Horton and Jean Dixon) and two new converts to the Case philosophy, Julia's alcoholic brother Edward (Lew Ayres) and her 'black sheep' sister Linda (Katharine Hepburn). Actually, Linda's conversion is a bit too complete -- she falls in love with Johnny. Directed in effortless style by Cukor, Holiday is a tip-top theatrical presentation that hits all the right notes with an engaging pack of characters. Grant is suitably spirited, but not silly; he makes jokes at the Seton's lavish townhouse but shows respect to Julia's father. Lew Ayres (Johnny Belinda) is the soak of a brother who's actually a good egg, and Katharine Hepburn is the frustrated spirit desperate to be liberated from her gilded birdcage. Julia and Linda's stuffy dad (well played by Henry Kolker) is also concerned about new ideas and other vague "things" in his business and wants to keep them at bay. We instantly identify him as a humbug. Why? Is Mr. Seton talking about Communists, or New Dealers or what? Holiday never defines its terms, and expects us to endorse its hero on the basis of his sincerity. I said that Johnny Case was a Wall Street Genius, and that he's also a sensitive soul concerned and curious about the world around him. I find that hard to reconcile in a guy who's about to spring the trap on a huge business deal that will net him a fortune, an amount sufficient to impress killer sharks like his prospective father in-law and the cold weasel Seton Cram (Henry Daniell, doing another thankless role for Cukor). No matter what Johnny says he's doing, it looks like he's found a slick trick to scoop up a heap 'o cash really earned by other people, and using it to finance a Junior Siddartha project. Poor Doris Nolan has the official thankless role as the fiancée who turns into a turnip, saying things like "Going after money is the most exciting thing there is!" She reveals herself to be a hostile b---- the moment Johnny doesn't keep his end of her bargain. She doesn't even deserve Ralph Bellamy as a consolation prize. Thus the true-hearted Hepburn gets her man and her triumph. Holiday is a charming romance that plays exceedingly well, but it's also a fairly meaningless fantasy about how the rich behave. The class system doesn't really work this way -- obnoxious snobs aren't always rich, and idealistic dreamers aren't exclusively poor. The Holiday disc in The Cary Grant Box Set looks good, not exceptional but par with other Columbia reconstructions from this time. The UCLA Film and Television Archive is given a credit for its restoration and a few scenes have more grain or are a bit soft, but overall it's a handsome job. The main extra is an informative and nicely-edited featurette on this disc about Cary Grant's years at Columbia, with good observations from authors Marc Wanamaker and Marc Eliot. It's followed by a look at some stills from a deleted opening scene set in Lake Placid. Columbia library discs have been doing without this kind of extra lately unless a high-profile title like Kramer vs. Kramer or Tess is involved. The featurettes on these discs are all unattributed; I guess someone in the Sony DVD department opened a window and they flew in. As for the fact that Holiday isn't available separately, well, that's what marketing is all about. I'd say that one might wait for the title to come out on HD, but that begs more questions: When, 2012? Will they have decided on a format by then, or will we be getting our videos by some other format, like intravenous injection? And with restorations as marginal as the jobs done on these old pictures, how much better is a picture like Holiday going to look? Undoubtedly one of the funniest comedies ever made, His Girl Friday is not a picture to see if one has a slight headache. Its wall-to-wall machine gun dialogue is overlapped, shouted and double-talked for 90 straight minutes. Howard Hawks took an already famous play and reworked its story of two manic newspapermen so that the reporter is the editor's ex-wife, thereby folding two or three extra layers of farce into an already overloaded omelette. Cary Grant and Rosalind Russell have enormous charm as a pair of amazingly cynical, infinitely resourceful tricksters. Russell has to think two steps ahead of the game just to stay one step behind Grant's sneaky moves. Editor Walter Burns (Grant) lies, steals, kidnaps and frames people to keep his star reporter and ex-wife Hildy Johnson (Rosalind Russell) from remarrying Albany insurance man Bruce Baldwin (Ralph Bellamy). A big story has come up in the pending execution of an unemployed sad sack, Earl Williams (John Qualen). He's being railroaded as part of a political ploy by the mayor (Clarence Kolb) and the sheriff (Gene Lockhart). While Hildy's poor fiancée Bruce is being arrested for everything from molesting a lady to passing counterfeit money, Hildy is sucked back into her professional role: Earl Williams escapes and she hides him in a roll-top desk, right in the middle of the press room at police headquarters. His Girl Friday plays so fast and loose with its jokes that few viewers realize that half of them are political: Poor Earl Williams has been tarred as a Communist to bring out votes for politicians who will benefit by his hanging. The press has misrepresented a streetwalker named Molly Malloy (Helen Mack of Son of Kong) as Earl's lover, and characterized the inoffensive Williams as a hardboiled killer. It seems he accidentally shot and killed a black police officer, thereby making his crime a racial incident! Among the million or so other verbal jests in this comedy rollercoaster are plenty of barely-hidden sexual innuendos, jabs against motherhood, and inside jokes. Actor Ralph Bellamy's name is dragged in sideways and Cary Grant makes a joke with his own birth name, Archie Leach. There's also some unforgivable banter in horrible taste about a black woman giving birth to a "pickaninny." Hawks stages his scenes in long takes that prove that his performers can handle lines as well or better than stage actors; on a second or third go-through one can catch a number of slip-ups that are expertly smoothed over by fast thinking and clever improvisation. Although most of the action is restricted to a newsroom, an office, a restaurant and a press room, Hawks opens things up just enough to see trigger-happy cops testing Earl's gallows, and Bruce phoning from his multiple trips to the city jail. We only hear about a crazy car wreck between Abner Biberman's crook and a car full of cops ("It was packed, they came tumbling out like oranges!") but we're treated to a full-on shot of Rosalind Russell (or her stunt double) running across the street with her skirt hiked up to throw a flying tackle at a key interview prospect. At first Grant's Walter Burns seems a complete villain. He double-crosses politicians, offers jobs he intends to yank back after he gets what he wants, slips people counterfeit money and frames his romantic competition three ways from Sunday. Hiding Earl from the authorities for his own purposes, he doesn't even flinch when his rigged theatrics cause an hysterical innocent to throw herself out a window. All of this, of course, is to prove to Hildy that she doesn't want to get married and should continue their crazy journalistic romance -- with a man with whom she once helped smuggle a human stomach, to get the goods on a poisoning. Even though Walter mercilessly manipulates Hildy's emotions we sense that staying in the newspaper game is what's best for her. After all, Hildy is the one who uses a quickie interview with Earl Williams to write a phony story about him and Molly, twisting "production for use" to refer to Earl's gun and the Mayor's gallows. Luckily for Earl, Hildy and Walter, the city around them is five times more corrupt than they are. The police force's main talents are shooting innocent bystanders and laying siege to empty houses. The crooked sheriff and mayor try to ignore the governor's reprieve long enough to see Earl Williams hanged. Cary Grant and Rosalind Russell are so charming that they make all of this naughty cynicism almost endearing. They exit laughing, something that their patsies Earl and Molly can't share. The pathetic Earl is probably going to get a life sentence, and Molly Malloy may be near death from her fall. The terrific ensemble cast includes a passel of press-room loafers that make a mockery of the journalistic profession: Porter Hall, Ernest Truex, Cliff Edwards, Roscoe Karns, Frank Jenks and Regis Toomey. Facts never get in the way of their impassoned headlines. They're moved to silence after reading Hildy's exploitative gallows editorial. Sony's DVD of His Girl Friday looks exceptionally good, sharper and cleaner than most of the other titles. That's a far cry from the horrible public-domain dupes that circulated for years. The answer for this miracle lies in the copyright printed on the disc. It is for the movie's underlying literary entity, the Hecht and MacArthur play. As much as we grumble about big studios' attitude toward some parts of their libraries, it needs to be said that only in studio vaults can treasures like His Girl Friday be properly protected. I'm for studios keeping and recovering their lost copyrights, if it means that the films involved will be maintained and preserved. The new His Girl Friday has a number of docu shorts, all of which appeared on the previous disc. A general featurette on the film is followed by pieces on Hawks, Russell and the famous play and its movie versions. Some are on the skimpy side, but they benefit from solid input from critics David Thompson and Molly Haskell. Haskell does an incisive autopsy on His Girl Friday's ideas on the role of women in society. Todd McCarthy contributes an authoritative commentary -- he's been writing much of the core literature on Howard Hawks for over thirty years. "- only Angels have wings"
This basic Howard Hawks adventure movie is the key to understanding his lifelong theme of the Harmonious Male Group in Action. Whether they're catching wild animals (Hatari! ), writing a dictionary (Ball of Fire) or fighting an alien invader (The Thing from Another World) Hawks' men are always pros doing a tough job who find meaning through camaraderie. And group sing-alongs. Only Angels Have Wings (the spelling above is from the main title card) places showgirl Jean Arthur in the middle of a Hawksian pack of air mail pilots, a mini-society that shuns outsiders who don't play by their rules. Outfitted in jaunty hats and slinging a gun, Cary Grant is the group's tough guy/old softie leader, a man's man fleeing the stifling influence of "women who like to make plans." Jules Furthman's script and Howard Hawks' directing of his ensemble cast are so good, we enjoy every minute we spend wih them. Pilot Geoff Carter (Cary Grant) runs a broken-down airmail service, flying planes through a dangerous mountain pass in the South American republic of Barranca. Entertainer Bonnie Lee (Jean Arthur) stops off for eight hours and is intrigued by the personalities she meets -- Geoff's best friend Kid Dabb (Thomas Mitchell) and a group of hard-drinking fliers who have made a communal pact with danger: If someone cracks up, he just wasn't good enough and is forgotten. Bonnie Lee ends up staying for a couple of weeks and watches Geoff's air crew grudgingly put up with Bat MacPherson (Richard Barthelmess), a disgraced pilot with a beautiful wife (Rita Hayworth) who happens to have been one of Geoff's old girlfriends -- one of the serious ones. Howard Hawks' best ensemble films capture qualities that movies seem to have lost. At any given moment the screen may hold twenty people and span five or six pages of dialogue. The "invisible" cutting style encourages us to concentrate on what's happening within the frame. We lose our sense of 'movie time' and simply go with the flow of the present-tense action. There's nobody quite like Howard Hawks in films like this one and The Big Sky; of the classic directors he's the one least likely to draw attention to his technique. The basic pattern in Jules Furthman's story is Jean Arthur's probationary period as she applies for membership in Cary Grant's all-male club. Grant's Carter seems to have ensconced himself in the semi-civilized republic of Barranca for the express purpose of escaping the tyranny of women, an oft-professed ambition of Hawksian males. "Women", says Carter, try to tell men what to do. That interferes in the serious business of risking one's life, the only activity that cuts the mustard in Hawks' universe. Carter's old flame Judy (Rita Hayworth) was apparently a great playmate, but she cramped his style. Her kind gets left behind. Jean Arthur's Bonnie Lee has promise. Like the golddiggers in Gentlemen Prefer Blondes she's a pro performer and knows the meaning of "the show must go on." Only Angels Have Wings balances several plots at once, but the main throughline is Bonnie Lee's advancement to acceptance in Carter's world. Bonnie Lee's first lesson might be called, "How to pretend nothing's changed when one of your best friends dies in a fiery air crash." Neither Bonnie Lee nor Judy are quite the perfect "Hawks women" of later films. In her star-making role, Rita Hayworth slinks around and dishes coy entendres in a style remarkably similar to Lauren Bacall's in To Have and Have Not; both actresses were presumably coached by Howard Hawks. But even though she's less of a man-killer, Bonnie Lee is the one who fits in the best. She has a snappier sense of humor and is more willing to dish the dirt with the boys. She also has that all-conquering musical talent essential to success in the Hawks world -- one of her specialties is playing the piano, which makes her the center of attention in the core Hawks bonding event, the sing-along. How Judy spends her time is not discussed -- she seems to exist only to be concerned about her husband. The flying millieu in Only Angels Have Wings is perfect for Hawks. It provides his heroes with a non-combat arena in which to test their manly characters. Carter and company withstand tough breaks while the 'male family' structure allows them to show their softer sides. There are no hardboiled cases here, as even the most disillusioned member reveals a heart of gold. The bitter MacPherson (Richard Barthelmess) earns forgiveness and regains his sense of respect. Some situations in Only Angels Have Wings have been successfully parodied in movies like Airplane! and The Big Bus, but the appeal of the original is unchanged. The group's unspoken code might as well be the basis for the test pilot philosophy represented in Tom Wolfe's The Right Stuff -- ya either got it, or you're a washout. Hawks' steamy port of Barranca is an immense stage interior, with a giant boat that pulls up to a dock and an impressive set representing a wharf, restaurant and adjoining airstrip (huh?) all only a few paces apart. Most of the flying is done with miniatures that can't have been very convincing, even in 1939; they're all stiff toys on wires filmed with great feeling but close to zero realism. The odd thing is that in this dramatic context, the lack of realism doesn't matter a bit. Contrasting with the artifice is a stunning aerial sequence flown and directed by the famous Paul Mantz. Barthelmess has to land on a narrow plateau amidst a scattering of barren cliffs. In one shot, his plane is tracked as it overshoots the ridge, circles tightly while skirting the cliff face on one side, and then pulls off a short-footprint landing. Grant is very good pretending to be an idealized man of action and ladykiller. He summons his reserve authority to withstand various sirens, make tough decisions and play the Great White Flier for Bonnie Lee's benefit. Jean Arthur is her delightful self, spending more time than usual in a confused funk -- or simply staying off-screen while the flyboy plot progresses. Rita Hayworth is what was once known as a solid sender. The only ridiculous part of the story is that the pilots drool all over the cute Jean, but don't even blink at the to-die-for Hayworth. More Hawks male fantasy: Where married women are concerned, the boys are all gentlemen, even Geoff. Silent star Richard Barthelmess has a hard-bitten haunted quality as the blackballed pilot -- he never defends his alleged cowardice. It's too bad that the film's tolerant and decent group spirit toward persecuted outsiders didn't rub off on the later blacklisters. Thomas Mitchell and Noah Beery Jr. ("Joe who?") are standouts in an ensemble of lovable jokers that includes Sig Rumann, Allyn Joslyn, Victor Killian, John Carroll, and Don "Red" Barry. Sony's DVD of Only Angels Have Wings is an improvement on the earlier single release disc. The picture is a lot cleaner, with some instability in the opening titles to tell us that it is the same source element, or perhaps a careful re-processing of the same digital transfer. The disc has an identical menu design but the extras are different. An advertising gallery is out and a new featurette is in: Critics Molly Haskell and Peter Bogdanovich discuss the essentials of the Howard Hawks world. 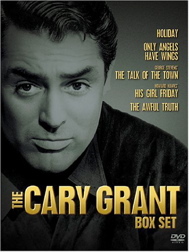 Overall The Cary Grant Box Set is a fine stack of movies that will delight all but Sony's faithful customers, the ones who have already bought the four individual discs and are now forced to buy them again to see Holiday. The only title Savant doesn't personally care for is Talk of the Town, and it's still quite watchable. Savant does hope that this set will encourage the studio to continue to bring out its library titles at an accelerated rate. They've announced another "four-old, one-new" Frank Capra box, and I'm sure more high-profile subject groupings will follow. But why not please the real movie fans with collections of Budd Boetticher / Randolph Scott westerns, Three Stooges features, Hammer horror films (The Gorgon, The Stranglers of Bombay, These are the Damned), Japanese Sci Fi (Mothra, The H-Man, Battle in Outer Space or classic horror films (The Black Room, The Face Behind the Mask)? Supplements: New Featurette on Howard Hawks' male universe. 1. The movie seems very aware of the war clouds - there are a couple of remarks about them, including a joke where the assembled 'good' characters give an insufferable snob (Binnie Barnes) a fascist salute. 2. Speaking of mental illness, the first day in Holiday is a Sunday, and the Setons attend a normal church service. Linda then makes plans for a big party in one week's time, on New Year's Eve! Doesn't that mean that the first Sunday should be Christmas day?